Products Description This Series Multi Gem Design All Have 5PCS A Group, Bohemina Style . 13 Colours Can Be Choosed,Each Style Divide into Gold-plating and Antique Silver (Metal Bead colour: Gold and Silver ) All of Our Products Designed by a Independant Designer,Unique and Exquisite,100% Handmade There are many kinds of natural stones,We can make sure that the product is made of 100% natural stone materials. Beige: Multi Gem*Lava Stone-White Marble-Natural Crystal-Ox Bone. 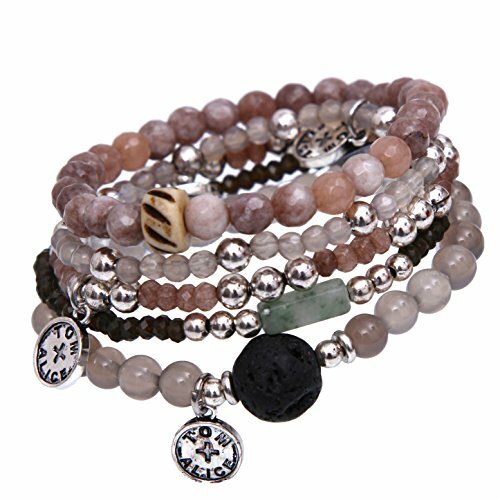 Gray-Pink:Multi Gem,Gray Agate-Spectrolite-Glass Crystal- Jade-Ox Bone. Blusih Green:Indy Agate-Jade Shell-Amazonite-Glass Crystal-Pearl pandent-Turquoise. Mixcolour:Watermelon crystal -Purple crystal-White Marble-Red Stone-Turquoise-Pink Crystal. Cyan:Turquoise-Blue turquoise -Glass Crystal-Topaz-Blue Crystal. Dark Cyan:Quartzite Pandent-White marble-Natural Stone-Lava Stone-Ox Bone-Blue Turquoise. Pink Blue:Natural Stone-Crystal-Jade Shell-Ox Bone. Pink:Natural Pink Crystal-Watemelon Crystal-White Marble. Light-Blue:New Jade -White Marble-Lava Stone-Matellic Glass. to Created Fashion and Novelty Women's Jewerly. Style,Superior Design.We Hoping to Win Your Recognition and Supporting.Thanks! 100% Natural stone jewelry pure manual,It's very beautiful when you wearing it.All design can be as a birthstone send to your mother, wife,sisiter,friends,girl friends or yourself.Each design have natural crystal and jade have natural healing pover. long term wearing will bring you lucky and happyness. Bohemina set jewelry always been a classic trend in women's fashion,it's appear on major fashion weeks and street or shops or magazine! Especially in summer bohemian is one of the most populary fashion style.Not Monotone Show Enthusiasm. If you have any questions about this product by tom+alice, contact us by completing and submitting the form below. If you are looking for a specif part number, please include it with your message.